Best commute ever! 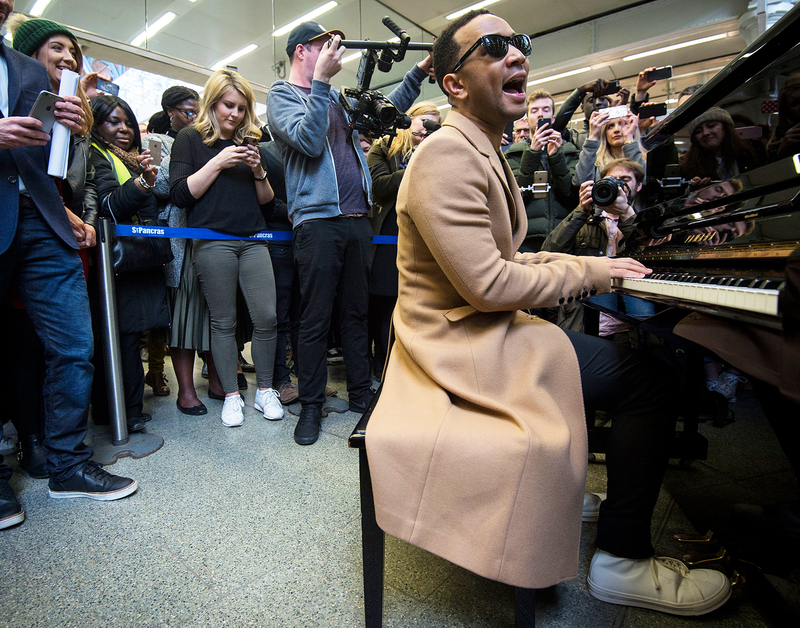 John Legend surprised travelers with an impromptu performance at a London train station on Wednesday, March 29. The R&B crooner, 38, was traveling from Paris to St. Pancras International station when he hinted to fans that he may have something up his sleeve. “Arriving at London @StPancrasInt on @EurostarUK. Do they still have that piano there?” he tweeted. Legend, who was wearing a tan coat and sunglasses, approached the piano, which had been sectioned off for him, and immediately began to play. Crowds flocked around the Grammy and Oscar winner as he belted out several of his hits, including 2004’s “Ordinary People” and 2013’s “All of Me.” He ended with a rendition of “Surefire” off his latest album, Darkness and Light. After he wrapped up the 15-minute performance, he stood up on the piano bench to wave to fans and take a bow before being quickly ushered outside by security. Legend seemed to be traveling solo, without his wife, Chrissy Teigen, and their 11-month-old daughter, Luna, while he promotes his upcoming world tour. The family recently vacationed in Morocco, where they rode camels, visited a local market and enjoyed an outdoor lunch. Luna even expanded her vocabulary on the trip, adorably saying “cat” for the first time in one of Teigen’s Instagram videos.